Earth scientists in Syracuse University’s College of Arts and Sciences have determined that the Tibetan Plateau—the world’s largest, highest and flattest plateau—had a larger initial extent than previously documented. Gregory Hoke, assistant professor of Earth sciences, and Gregory Wissink, a Ph.D. student in his lab, have co-authored the article with Jing Liu-Zeng, director of the Division of Neotectonics and Geomorphology at the Institute for Geology, part of the China Earthquake Administration; Michael Hren, assistant professor of chemistry at the University of Connecticut; and Carmala Garzione, professor and chair of Earth and environmental sciences at the University of Rochester. Hoke’s research was funded by the Tectonics Program, part of the National Science Foundation’s Division of Earth Sciences. Known as the “Roof of the World,” the Tibetan Plateau covers more than 970,000 square miles in Asia and India and reaches heights of more than 15,000 feet. The plateau also contains a host of natural resources, including large mineral deposits and tens of thousands of glaciers, and is the headwaters of many major drainage basins. Hoke says he was attracted to the topography of the plateau’s southeast margin because it presented an opportunity to use information from minerals formed at the Earth’s surface to infer what happened below them in the crust. But years of studying rock and water samples from the plateau have led Hoke to rethink the area’s history. For starters, his data indicates that the plateau has been at or near its present elevation since the Eocene epoch. 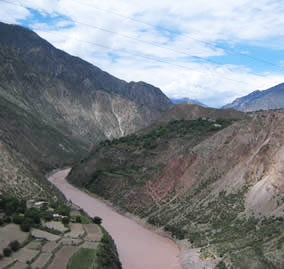 Moreover, surface uplift in the southernmost part of the plateau—in and around southern China and northern Vietnam—has been historically small.